last week, we heard from surachai sombatcharoen.. this week we have another "surachai", and another "sombatcharoen"! following the murder of suraphon sombatcharoen in 1968, a number of similar-sounding singers came out to fill the void, but none proved ultimately satisfactory. 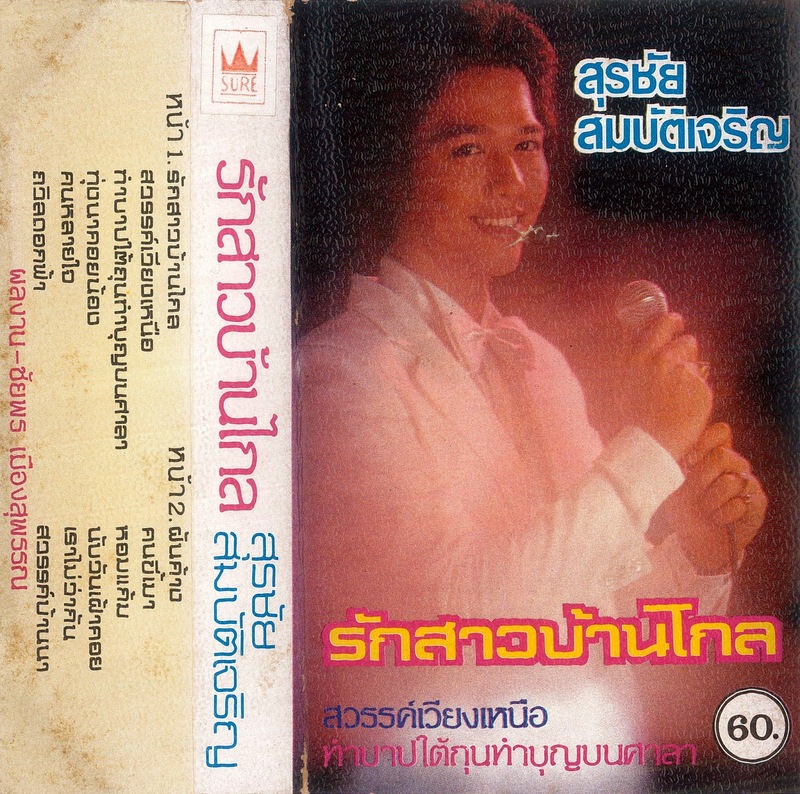 however, when suraphon's son surachai rose to stardom in the 1980s (with a unique voice of his own) the search for his father's sound-alikes began anew. finally, surachai folksong (surachai charoenkitchaichana), a guitar-playing singer-songwriter working as house performer at villa café on new phetburi road in bangkok, was discovered, with a voice that was a real echo of the legendary singer. after a string of albums featuring folk rock-oriented rewrites of suraphon's hits, surachai folksong faded back into obscurity, although his songs still circulate online today (often mistakenly attributed to surachai sombatcharoen). rounding out our cassette's second side is surachat, a lesser-known sibling of the sombatcharoen clan. this week, we'll hear some classic 70s luk thung from surachai sombatcharoen! son of suraphon sombatcharoen, the star singer often called "thailand's elvis", surachai led a priveleged upringing compared to the early lives of many luk thung stars (highschool in england, higher education in bangkok) notwithstanding the troubles that attended his father's fame: young surachai recounted receiving threatening phone-calls, dodging gunfire, bombs and other extreme actions from his father's many rivals. over the years, surachai has found fame as singer, actor, radio d.j. and even politician. 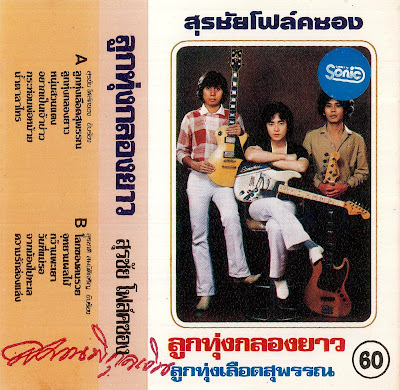 this cassette primarily features 1970s-style stage band disco, occasionally dipping into more traditional sounds with angkhalung and piphat ensembles joining in, all from the pen of songwriter chaiyaphon mueangsuphan. enjoy! 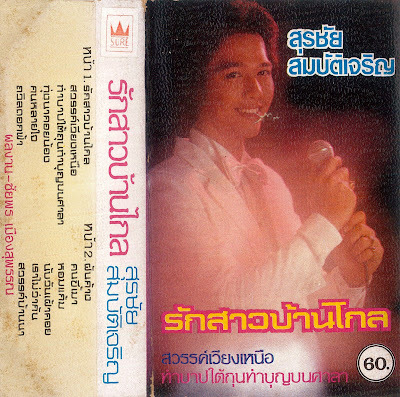 a few weeks back, we had a lae-pop album from achan prasit nakhonphanom; today we find him leading an even more explicitly religious project; a cassette intended to soundtrack (or document?) the proceedings of a thai buddhist ordination ceremony! the music consists of an uncredited piphat ensemble running through instrumental pieces that correspond with the stages of the ceremony; music to accompany the tonsure, procession around the temple, and all the rites associated with entering monkhood. enjoy!